Remember that part in the movie Forrest Gump where Lieutenant Dan is talking about how it’s a tradition in his family to die in combat? He describes how his father, and his father’s father, and his grandfather’s father (and on and on) were killed in war; that this is the legacy in his family. He was even upset that he had not been killed in combat! As someone watching the movie (who also had a brother in the military) I remember thinking why in the world would you want to continue that tradition? One of pain, misery and loss? 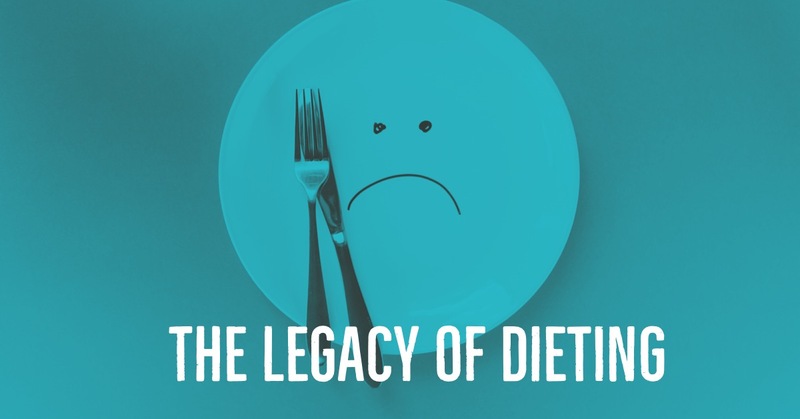 As odd as it sounds, it’s not really that different than the legacy of dieting I see passed down in families from generation to generation- what I have dubbed the legacy of dieting. The legacy of dieting goes something like this: Grandmother (or grandfather, although it is usually through the mother’s side) is taught to dislike her body, diets and restricts eating, focuses on body and weight loss, makes negative comments about her body (and other people’s bodies), reinforces body dislike and distrust, focuses on daughters (and sons) body and says- “be careful you don’t want to be like me,” puts child on their first diet, bonds over dieting together and body dislike. Daughter (or son) then grows up hating their body, confused about food and only knows restriction, dieting, body dislike, and fear of gaining weight as normal. So they too stay stuck in this cycle and then passes it on to their children and their children’s children and so on. It’s extremely sad and extremely common! 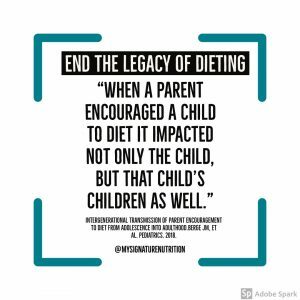 Research supports that the legacy of dieting is a real phenomenon but more eloquently calls it “intergenerational transmission of dieting.” A recent study published in April of 2018 found that when a parent encouraged a child to diet it impacted not only the child, but that child’s children as well (which just continues the cycle). likely to be at a higher weight, engage in dieting, binge eating, unhealthy weight control behaviors, and experience increased body dissatisfaction as adults. I don’t think that’s really what mom’s are intending to pass on when they’re focused on their child’s weight. 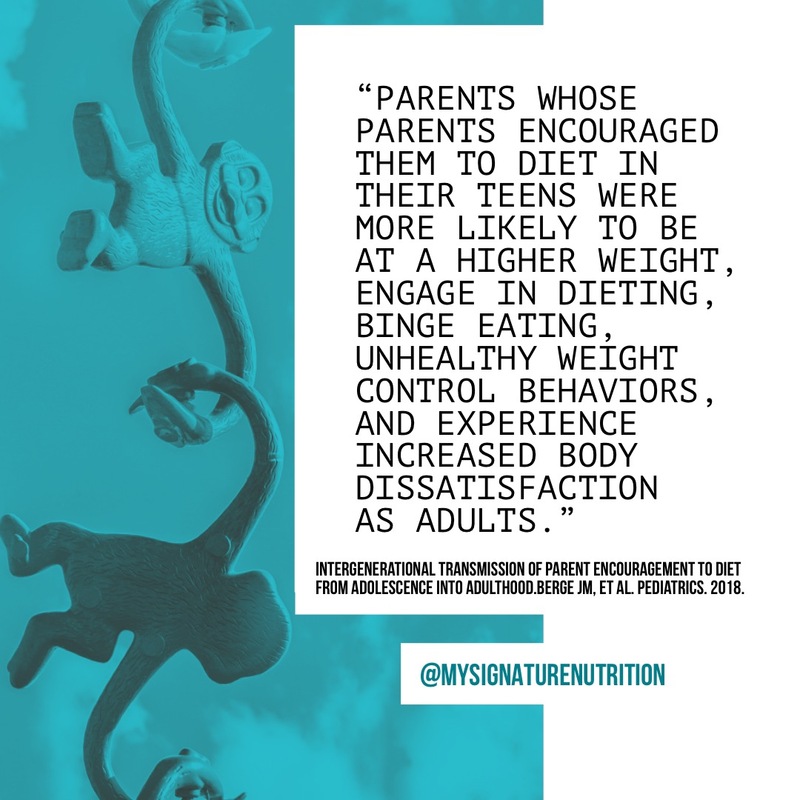 I believe that moms (or parents in general) think that they’re helping their child have a better quality of life- not triggering a cascade of self hate, dieting, and worse health outcomes. It’s this belief that they’re helping that makes the legacy of dieting so hard to stop. Of course no one wants to see their child suffer, so they keep doing what they know and the legacy continues. Dieting is all you know. It’s your reality, it’s what you’re comfortable with, and it feels like there are no other options. When you don’t know there’s an alternative to dieting, you can’t do anything different because it’s all you know. Not dieting feels wrong. When you’re dieting or engaging in weight focus, there’s a set of rules that you follow for what, when and how much to eat whether you’re on or off the diet. When you stop following these rules it feels wrong because it feels like you’re breaking the rules. 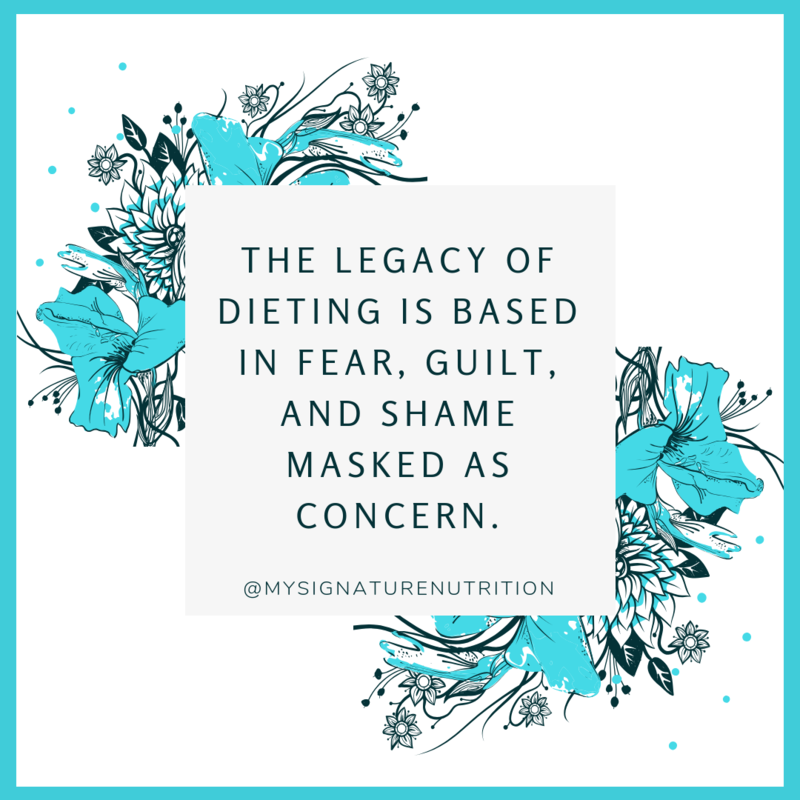 You feel increased guilt and shame and in the beginning it feels more comfortable to be on a prescriptive diet plan because it’s what you know. Dieting may be the basis for your relationship with your mom or family. This means when you stop dieting it feels like you’re betraying your mother, your family- your legacy- which regardless of what that legacy is (ahem, being killed in war) it doesn’t feel good- it feels bad and wrong. It may even make you feel like a failure even though you are the one breaking a legacy that has caused significant harm. In addition, it may cause strain in your relationship and you might not have anything to bond or over talk about. But, it may actually result in a more meaningful deeper relationship with time and intention. You’ve been taught to believe that if you’re not dieting then you’re not taking care of yourself. You’ve been taught that your health is based on your body, how you manipulate it and your eating. In reality, this is the diet culture, and it’s downright harmful. 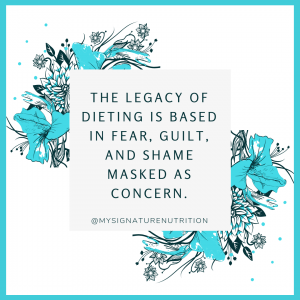 The legacy of dieting on the surface says it cares about you and wants you to be real, but it’s really fear, guilt, and shame masked as concern. This only enhances your feelings of guilt and shame about your eating and your body. It makes it really difficult for you to know true care, concern, and well-being. You might change, but your family probably won’t. 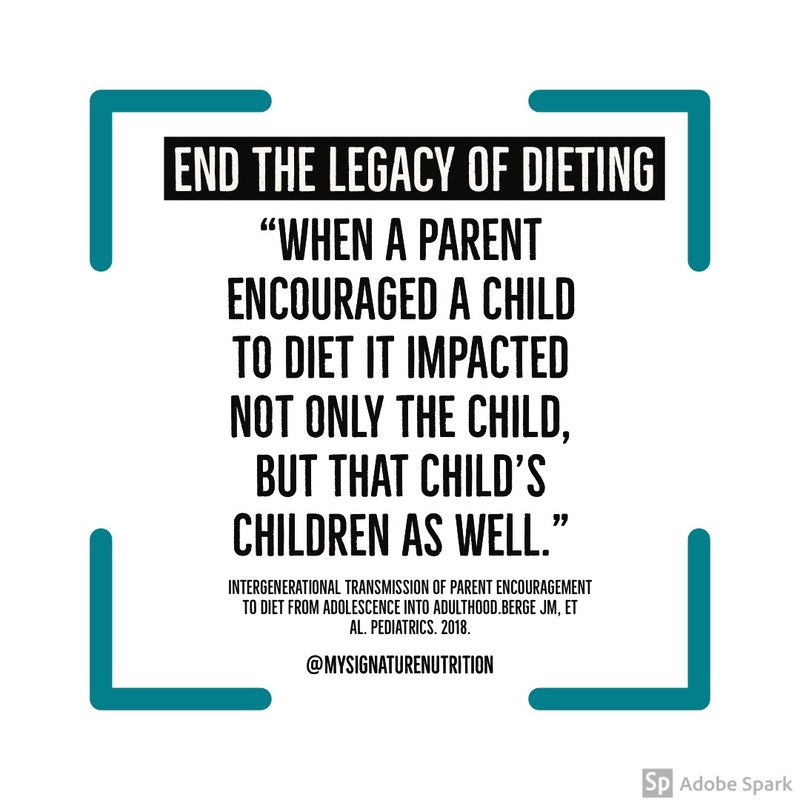 It may be possible for you to end the legacy of dieting and stop it for future generations- but your mother and her mother probably will not shift their weight focus. They will probably continue to comment on your body and your eating no matter how many times you ask them to stop because they are so entrenched in this pattern and cannot see a way out. This continued pressure makes it harder (but certainly not impossible) for you to exit the legacy of dieting and stop it once and for all! This creates a legacy that is difficult, but not impossible to break free from. It also creates an opportunity that creates intergenerational freedom with food, improves body acceptance, and health. While it might be difficult to change, it’s definitely worth it. So as I write this post near mother’s day I implore you to consider if you are (or were) a legacy dieter. Think about what eating was like in your family growing up, about who made the most body comments to you- were they accepting or based in shame? Spend some time journaling and reflecting on the following questions, then click over to my next blog on 5 ways to break the legacy of dieting for good. What was food and eating like in your family growing up? What was your mother and grandmother’s relationship with food like? Was there weight focus on your body or other people’s bodies? When do you first remember being concerned about your body weight or shape? When did you go on your first diet? Why? What messages did you receive from your family about your body? 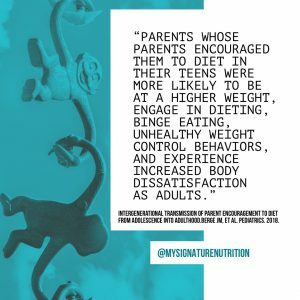 Does your family (parents or children) still engage in dieting or diet talk? What messages have you internalized from your family about food and body that you still hold on to?